Throughout the medical and pharmaceutical industries special medical devices are used constantly, and the need to transport these expensive devices is critical. At Bel-Air Cases we are consistently tasked with manufacturing specific made-to-order cases so that those in the medical profession can ship and transport devices without worry of breaking or damage. In pharmaceutical cases we are often required to build cases that can withstand temperature changes, so that sensitive material can be shipped without fear of damage. These cases need to be visually appealing while being fully functional at the same time. We build shipping and transportation cases for all situations. Including expensive medical devices for sales representatives, implants, and emergency medical services (EMS) case solutions. At Bel-Air we follow best practices in the engineering of custom transportation cases and we are equipped to engineer and build literally for any situation. At Bel-Air we pride ourselves on designing, building and delivering the best custom medical cases. We’ve been satisfying the needs of medical and pharmaceutical professionals for over 50 years. All of our medical shipping cases are manufactured using high density polyethylene plastic which provides strength and impact resistance. We build in molded bumpers for unsurpassed medical devices protection. We mold-in ribs and channels for stacking stability when multiple cases need to be stored or shipped. Our cases can withstand temperatures from -80 degrees F to +180 degrees and we have nearly limitless custom options available to satisfy the unique needs of our clients. At Bel-Air Cases we’ve worked with the top brands in the medical community and we’d love to help you with your custom case needs. Polyethylene Plastic Case Manufacturing at Bel-Air-Cases, Ontario, CA. Polyethylene, the largest volume thermoplastic polymer used in the market today, is considered the work horse of thermoplastics. Some polyethylenes are flexible, others are rigid; some have poor impact strength, others are virtually unbreakable. At Bel-Air-Cases we manufacture our made-to-order cases using high-density polyethylene also referred to as HDPE. The benefits of using HDPE plastic for our cases is vast. It has several properties that make it ideal as a packaging and manufacturing product. It’s stronger than standard polyethylene, acts as an effective barrier against moisture and remains solid at room temperature. It resists insects, rot and other chemicals. HDPE also creates no harmful emissions during its production or during its use by the customer. Also, HDPE leaks no toxic chemicals into the soil or water. HPDE is also extremely lightweight, due to the density of the material. This not only makes the manufactuing of our cases faster and easier, but it also makes transporting lighter. The low weight combined with the many options that high density polythene is available in, make it an ideal choice for creating custom cases for our customers. Thermoforming Process at Bel-Air-Cases, Ontario, CA. Bel-Air-Cases uses a process called thermoforming to produce high-end custom cases. Our expert staff will assist you with designing, customizing, and selecting options to build a truly custom “made-to-order” case. We use vacuum forming and thermoforming which is the ideal solution for producing heavy duty carrying cases. During the vacuum forming process, plastic sheets become heated until they are malleable enough to form around a mold. 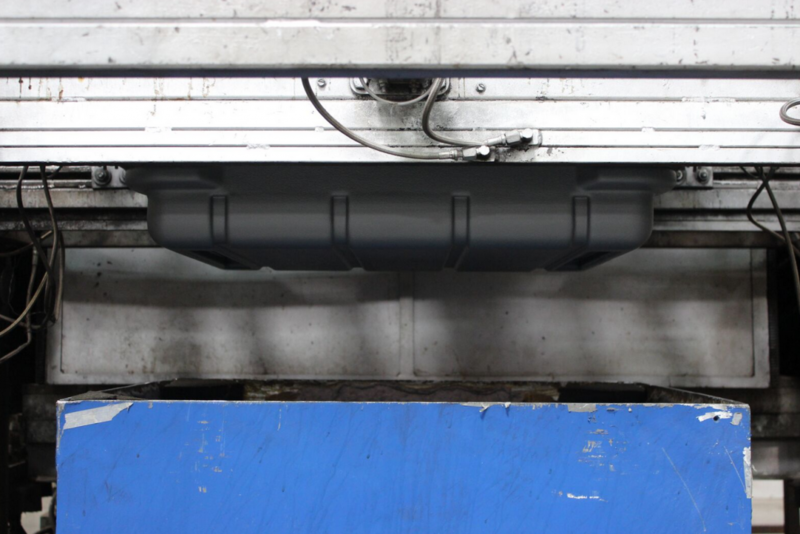 It is a simple process that produces resilient, lightweight, and seamless case shells quickly and efficiently. Our vacuum formed case shells are produced individually components that leave the process as the intended product, or occasionally as a substantial part of the intended product; these parts are good substitutes for sheet metal or fiberglass materials due to enhanced durability and higher strength-to-weight ratios. The vacuum forming process is one-sided; meaning the finished part’s shape and detail are both on one side. Advantages of vacuum forming include less expensive tooling, fast turnaround and easier maintenance and modification as compared to an injection molding process. We use thermoforming to form thermoplastic sheets into three-dimensional case shells. Thermoforming requires a relatively low level of forming pressure, so tooling can be constructed rapidly and less expensively compared to other molding processes. Fast cycle times, combined with automated sheet-feeding equipment, allows Bel-Air-Cases to provide rapid turnaround of our cases. We utilize a combination of automated, manual, and digitally controlled equipment to fabricate parts composed of polyethylene, polycarbonate, high-impact styrene, and several other materials. We focus on product quality and durability. Tight control of the materials and processes we use allow us to build the highest quality cases for your unique needs. To learn more about our processes please give us a call at (866) 235-2472 or send an email to info@bel-air-cases.com. Bel-Air-Cases specializes in using vacuum forming to create high-quality cases. In this process, cut sheets of plastic are heated in ovens which use ceramic or gas heaters with zone controls to maintain an accurate measurement and control the sheet temperature. The sheet is then placed over a mold and a vacuum is applied, pulling the sheet into the shape of the mold, creating vacuum formed molds. This process is popular for large parts such as the truck bedliner seen in this picture. Vacuum forming usually offers the lowest tooling costs and quickest delivery of tooling, compared with traditional processes. 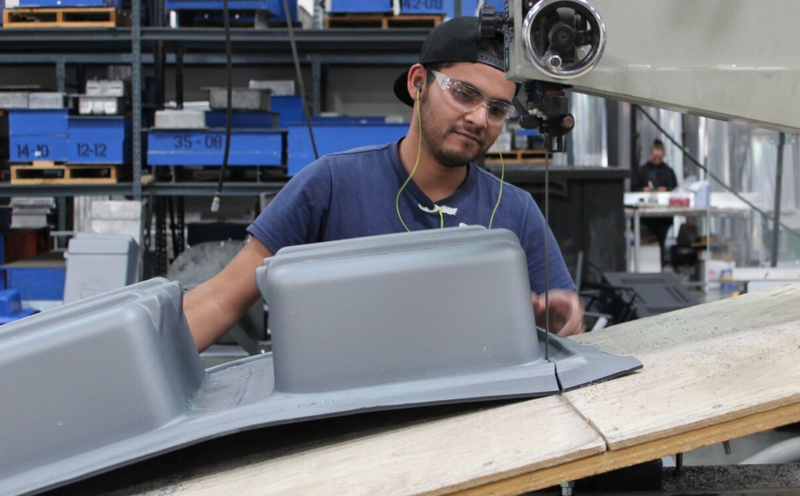 Our specialty in the vacuum forming and thermoforming process allows us to specialize in customization the customization of thermoplastic cases for a variety of industries. Our expert staff of engineers who can help with the design process, complete customization, and selection of options to best match your needs. What sets our process apart is the ability to manufacture complex patterns and shapes, uniqie to your specific needs. With rapid turnaround time on vacuum formed cases, a range of size options, and a commitment to product quality, we strive for optimal performance in our services. Quality is a top priority for Bel-Air-Plastic cases and it shows in every step of our process, from careful control of the raw materials we use to process parameters that allow us to match individual needs for each of our customers. Connect with Bel-Air-Cases to learn more about how we can help you with your project. If you are interested in learning more about our “made-to-order” cases, simply give us a call at (866) 235-2472 or send an email to info@bel-air-cases.com. We look forward to speaking with you! Custom Foam Interior Cases at Bel-Air-Cases, Ontario CA. 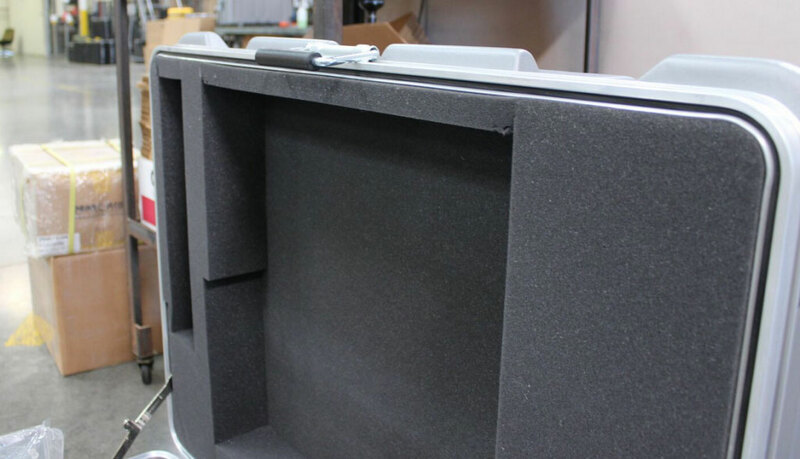 Why choose a Bel-Air equipment case with a custom foam interior? When you’re transporting expensive equipment, such as cameras and computers, you need the proper cushioning to protect their value and your investment. Because of this Bel-Air-Cases offers the option to construct custom foam sets for around the same price you’d expect to pay for cases filled with foam slabs or diced foam. We offer a variety of custom foam interior cases to choose from. We’ll even work with you to create a custom equipment case with foam that fits your specific needs. Our expert staff that will take the time necessary to understand specific requirements and design a custom foam interior unique to your needs. We use foam-cutting machines to handle complex cushioning requirements. We can design and manufacture the interior of the case using a CAD layout, or if our customers already have a specific layout we can adhere to those guidelines. Our in-house tools and equipment make it extremely easy to turn a basic cushioned case into custom designed carrying or shipping case capable of protecting your valuable equipment. Since Bel-Air-Cases manufacturers made-to-order cases for nearly every industry, we’re equipped with the latest technology to perform quality control and assurance, such as drop testing, to protect your valuables from unforeseen mishandlings and events. Our experts build and test a wide variety set-ups. You can be assured that our made-to-order equipment cases with foam interiors will provide the utmost in protection and durability for your equipment and valuables. Looking for more information on our custom equipment cases with foam, or curious about our pricing? Feel free to give us a call at (866) 235-2472 for a personalized quote. You can also request a quote online: just fill out our Request a Quote form and one of our friendly customer service specialists will be in touch with you shortly.